The law firm of Weinstein, Kaplan & Cohen, P.C. focuses on handling family law, commercial litigation, as well as others for clients throughout the New York metropolitan area. 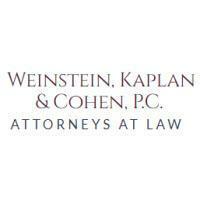 Weinstein, Kaplan & Cohen, P.C. is located in Garden City, New York, and serves clients throughout the New York City (NYC) metropolitan area including Nassau, Suffolk, New York, Kings, Queens, Richmond, Bronx, Westchester, and Rockland counties, the villages of Mineola, Westbury, Cedarhurst, Hewlett, Inwood, Lawrence, Woodmere, and the cities of Bronx, Brooklyn, Manhattan, Staten Island, Queens, and Long Island.